Neurons are the brain’s superhighway: there are over 90 billion neurons connecting a complex network that enables us to interpret and react to our surroundings. Neurons are composed of the cell body, the axon and the axon terminal, communicating with each other by sending electrical signals down axons and off to adjacent cells. When we hit our heads, the brain can bounce around in the skull; a concussion is a traumatic brain injury (TBI) that’s a result of the rapid motion of the brain inside the skull. On a neurological level, individual neurons can be stretched and damaged, affecting brain chemistry.1 Symptoms range from loss of consciousness to disorientation to sensitivity to sound and light. Axons are like wires; they help neurons reach cells in different parts of the brain. But they’re fragile and injury-prone, and after a concussion, axons are usually more damaged than other parts of the brain’s cells. This damage to the transportation system makes it difficult for the brain to send signals and thus function. This is a scan of how traumatic brain injury manifests in the brain. Microtubules are also part of this transportation system, much smaller than axons but still important in the delivery of materials within the cell. They’re susceptible to even smaller impacts than concussions. And because they’re so small, microtubules gain structural support from a special protein called tau. In healthy brains, tau supports the microtubules, which help the brain function and operate normally. With repeated microtubule breakdown, tau protein can float freely inside the cell. Free tau protein can change shape and clump together–at this point, it can spread to surrounding brain areas, growing even without additional head trauma. Chronic traumatic encephalopathy (CTE), is a degenerative brain condition believed to be caused by repeated lower impact hits to the head. A unique pattern of tau spread is associated with the disease, killing brain cells.The spread of tau in the brain, which has been linked to CTE. Symptoms of CTE range, and may include everything from impaired executive brain function and short-term memory loss, and can lead to an upset of circadian rythm, sleepless nights, extreme and chronic fatigue, headaches, chronic pain, depression, substance abuse second to pain and depression, emotional instability and eventually suicidal thoughts or behavior. It's easy to see how these symptoms all connect and how slippery the slope can be when CTE is involved. Scientists have known about the brain damage caused to professional boxers since the 1920s, with the disease originally being called dementia pugilistica.3 In recent years, studies have looked at professional football players, and the findings have been so eye-opening it’s impossible to look away. One study, which analyzed the brains from 202 deceased football players, CTE was neuropathologically diagnosed in 177 (87%). When looking specifically at those who played in the NFL, that number rose to 110 of 111 samples (99%).4 Remember, these samples were donated, which means donators likely suspected CTE even before the diagnosis. That skews the samples, but the findings remain important. The first confirmed case of CTE in an NFL player was documented only in 2005 by Dr. Bennet Omalu.5 The study was made famous through the film “Concussion,” in which Will Smith portrayed Omalu. Part of Omalu’s conclusion was a desire for continued research on the subject, because his study was conducted on a single research sample. Dr. Ann McKee, director of Boston University’s Chronic Traumatic Encephalopathy Center, has been leading much of that research. 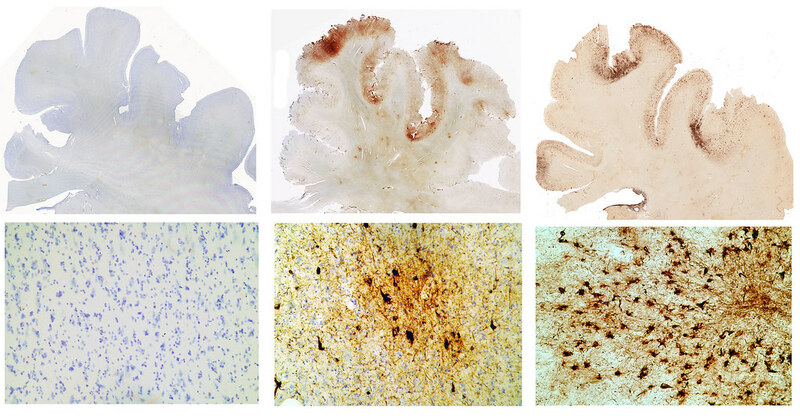 She and her team have studied tauopathy after repetitive head injury, detailing the patterns found by the spreading of tau.3 The difficult thing about CTE diagnosis is that it can only happen postmortem with a neuropathologic examination of brain tissue. Reference check- "postmortem" means "after death." Doesn't this seem a little late to receive a diagnosis? As there is no way to make a conclusive positive diagnose during the affected's life, it's important to consider how many athletes or others are actually suffering from CTE, but diagnosed with a psychological or "mental illness"? Even those who don’t pay attention to sports have likely heard of Aaron Hernandez, the former New England Patriots tight-end and convicted murderer who ended his own life while in prison. McKee and CTE BU researchers found his case to be the most severe they’ve seen in a young person. Dr. Ann McKee, director of Boston University’s Chronic Traumatic Encephalopathy Center, who is a leading CTE researcher -via Boston University. When analyzing symptoms of military veterans diagnosed with CTE, researchers found some individuals were also diagnosed with PTSD, drawing lines between commonalities in symptoms and possibly shared pathogenetic foundations.9 More research is needed to understand the connection, but the suggested linkage could exacerbate symptoms. The bottom line? Concussions are more serious than we thought.10 These injuries, occurring on the battlefield of the football field (or even accidentally in everyday life), can change personality, cognitive performance and can increase the risk for suicide. They can change a life forever, or end it. What Can be Done to Reduce TBI and CTE? Not everyone in the military or NFL have CTE or other brain injuries. And there are many others at high risk, most notably female athletes, particularly soccer players. Why? Because women's skulls are thinner, and less capable of protecting impact to the head. There has also been growing research that suggests certain nutrients have emerged as a potential strategy to prevent or reduce the deleterious effects of concussions. Things like creatine and curcumin were used in a recent study,14 along with omega-3 fatty acids. Sound bathing, vibrational therapy, neurofeedback, and cold laser light therapy (which penetrates the cells and ignite mitochrondria to aid in brain cell energy needed to heal the cell) are all viable methods to work toward neuroplasticity, and to reactivate or recharge bruised, scarred or diminished underperforming brain tissue. It's highly advisable to start a nutritional protocol that focuses on some brain basics such as magnesium, zinc, omega-3s, plant antiinflammatories such as turmeric and ginger, choline, theanine and others. It's a little early though possibly helpful to adopt a keto diet, temporarily at least. This is not easy to do and will be working on a Pinterest Page or PDF for patients which includes all the information, meals and snacks needed to adhere to a Keto Diet. There are products you can injest (exogenous Ketones) which may also h elp. As mentioned, it is not too early to consider neurofeedback, cold laser light therapy, and of course, yoga, breathing exercises, and sound healing. These are less researched though also non-toxic with no risks to speak about, and many documented positive results. Dr. Hightower, Chiropractor in Raleigh, North Carolina is fully equiped and currently seeing brain injury patients and working with all of these modes to help shift brain wave patterns which may have been affected by brain injury as well as PTSD, sleeping problems in general, etc. Daily yoga, breathing exercises, exercise, and inversions (hand, head stands, or even dropping your head below your knees in a sitting position) are things you can do for virtually free and immediately to start circulating the brain better. These practices promote blood flow and the potential growth of brain tissue if nutrition is also included. Doing everything together may be more effective than trying one at a time; they all work together in building or rebuilding healthy brain tissue and patterns. With more research around nutrition and brain repair, many studies have been done on animals, with research suggesting that the ketogenic diet could be useful for children suffering from TBI injuries.15 Similarly, fasting (which leads to ketosis) studies on rats showcased that, after moderate cortical impact, fasted subjects showed a significant increase in tissue sparing. In patients with cerebral injury, one study found that administering ketones may provide a significant benefit.16 While dosage, timing, and administration methods all need further research, the results are exciting, as ketones could be employed to manage acute brain injury. Two to three days after an impact, there is a hypometabolism of glucose and the brain is starved of energy. Ketones can bypass glucose metabolism and maintain brain energy levels, thus potentially limited damage. Despite various methods to induce ketosis, (both exogenously and endogenously), results indicate that the presence of elevated ketone levels in the blood can help recovery for those who suffered a brain injury. We are working to build a keto diet recipe book- which focuses on plant based foods as well as seafood and eggs for the majority of proteins, but also supports ketone production, helpful for brain injury recovery as well as weight loss. As science continues to explore the subject, we’ll continue learning about how brain injuries happen, how to treat them and hopefully, how to prevent them too. What’s clear now? They’re a problem in the NFL and the military, two occupations where some of the world’s elite performers push their bodies to the absolute limit. Sometimes, the result is a concussion or another type of TBI, and later down the line, the result is increasingly becoming CTE. These types of injuries aren’t exclusive to the NFL and military. You could slip, fall and hit your head. You could accidentally run into something. You could be a female soccer player who frequently heads the ball. Women and children are highly susceptible due to their lower density and thereby less protective skull. The possibility for brain injury is ever-present. The scientific community is committed to finding answers, and we also hope to be part of the solution. Please feel free to contact us for more information or specific recommendations. 2. Tagge CA, Fisher AM, Minaeva OV, et al. Concussion, microvascular injury, and early tauopathy in young athletes after impact head injury and an impact concussion mouse model. Brain, Volume 141, Issue 2, 1 February 2018, Pages 422–458, https://doi.org/10.1093/brain/awx350. 3. McKee AC, Cantu RC, Nowinski CJ, Hedley-Whyte ET, Gavett BE, Budson AE, Santini VE, Lee HS, Kubilus CA, Stern RA. Chronic traumatic encephalopathy in athletes: progressive tauopathy after repetitive head injury. J Neuropathol Exp Neurol. 2009 Jul;68(7):709-35. 5. Omalu BI, DeKosky ST, Minster RL, Kamboh MI, Hamilton RL, Wecht CH. Chronic traumatic encephalopathy in a National Football League player. Neurosurgery. 2005 Jul;57(1):128-34; discussion 128-34. 6. McKee AC, Alosco ML, Huber BR. Repetitive Head Impacts and Chronic Traumatic Encephalopathy. Neurosurg Clin N Am. 2016 Oct;27(4):529-35. 7. Mez J, Stern RA, McKee AC. Chronic Traumatic Encephalopathy: Where Are We and Where Are We Going? Curr Neurol Neurosci Rep. 2013 Dec; 13(12): 407. 8. Goldstein LE, Fisher AM, Tagge CA, et al. Chronic traumatic encephalopathy in blast-exposed military veterans and a blast neurotrauma mouse model. Sci Transl Med. 2012 May 16;4(134):134ra60. doi: 10.1126/scitranslmed.3003716. 9. McKee AC, Robinson ME. Military-related traumatic brain injury and neurodegeneration. Alzheimers Dement. 2014 Jun; 10(3 0): S242–S253. doi: 10.1016/j.jalz.2014.04.003. 10. Peskind ER, Brody D, Cernak I, McKee AC, Ruff RL. Military- and Sports-Related Mild Traumatic Brain Injury: Clinical Presentation, Management, and Long-Term Consequences. J Clin Psychiatry. 2013 Feb; 74(2): 180–188. doi: 10.4088/JCP.12011co1c. 12. Alosco ML, Mez J, Tripodis Y, et al.Age of first exposure to tackle football and chronic traumatic encephalopathy. Annals of Neurology. 2018; 83(5); 886-901. 16. White H, Venkatesh B. Clinical review: Ketones and brain injury. Critical Care. 2011;15(2):219. doi:10.1186/cc10020.